Let’s talk about your choices. At a time of crisis, facing separation or divorce, you must make a critical decision — the lawyer who will guide you through the process. Anne Freed, Family Lawyer, Mediator and Arbitrator, is committed to finding a path that doesn’t end up in court. She’s seen first hand the effects of an adversarial process, particularly on children. With over 35 years of experience in family law and litigation, and advanced education in mediation, collaborative process and arbitration, Anne does whatever it takes to help you avoid a destructive divorce and bring you peace of mind. She explains the process options available to you, depending on the facts, legal issues, and the emotional components. 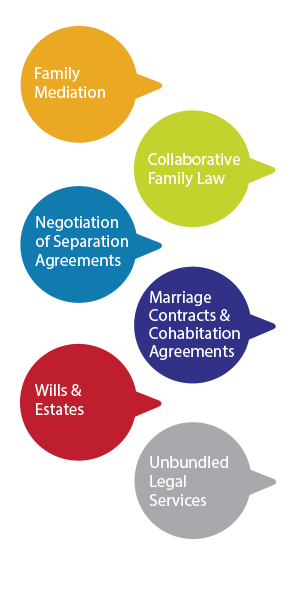 If you’re facing separation or divorce, you need an experienced, trusted advisor. Anne Freed is equipped with a toolbox of creative resources and solutions to move your life forward. She’s also a strong, tenacious advocate for you, regardless of the process options you choose. After some research, we decided to engage Anne Freed to help facilitate our separation. Anne helped us identify our mutual goals and kept us focused on what needed to be done. Her friendly, fun and matter-of-fact personality helped us deal with these complex issues. Her vast knowledge of family law enabled us to feel better educated. She was careful to remain neutral and to not give advice, but would present us with facts we should consider in our decision making. At the end of the day, we had a draft separation agreement we could each take for independent legal advice to arrive at a final agreement, and have now started our new lives. That's not to say this journey was easy; it was still a very difficult process that took a lot of time and effort. Overall, I felt like we worked through the process as a team of three: Me, My Ex, and Anne. After some research, we decided to engage Anne Freed to help facilitate our separation. Anne helped us identify our mutual goals and kept us focused on what needed to be done. Her friendly, fun and matter-of-fact personality helped us deal with these complex issues. Her vast knowledge of family law enabled us to feel better educated. She was careful to remain neutral and to not give advice, but would present us with facts we should consider in our decision making. At the end of the day, we had a draft separation agreement we could each take for independent legal advice to arrive at a final agreement, and have now started our new lives. That's not to say this journey was easy; it was still a very difficult process that took a lot of time and effort. Overall, I felt like we worked through the process as a team of three: Me, My Ex, and Anne. Anne was integral in ensuring my ex-partner and I were able to maintain clear and respectful communication with one another throughout the entire mediation process. Anne's legal background was also key in keeping us well informed and aware of our options (and possible repercussions) regarding financial matters, which helped us in arriving at a fair agreement in the end. Lastly, she was conducive in my ex-partner and me solidifying an ongoing and friendly relationship to this day. It truly was a pleasure working with Anne, who maintained a professional, caring and considerate disposition throughout the mediation process. Anne was integral in ensuring my ex-partner and I were able to maintain clear and respectful communication with one another throughout the entire mediation process. Anne's legal background was also key in keeping us well informed and aware of our options (and possible repercussions) regarding financial matters, which helped us in arriving at a fair agreement in the end. Lastly, she was conducive in my ex-partner and me solidifying an ongoing and friendly relationship to this day. It truly was a pleasure working with Anne, who maintained a professional, caring and considerate disposition throughout the mediation process. Dear Anne; I want to thank you for your work in handling my separation. Thank you for helping to create a separation arrangement inside of which our son is properly taken care of, both emotionally and financially, and that his parents can get on creating the next part of their lives. I want you to know that you made a difference in how I get to live my life. Dear Anne; Words are not enough to express the appreciation we all feel for the extra effort and hard work you put forth on our behalf. We all hope now for a just and amicable solution to this case. Again – many thanks! I visited Anne Freed with respect to a constructive trust claim against me by my former common law partner. Anne explained my position; she gave me excellent advice and strategy which has given me peace of mind. I recommend her highly. Dear Anne; Thank you for the effort you put forth in the mediation process. You were very professional, yet supportive and helpful. You made a life-changing situation a bit more bearable. I enjoyed working with you. You explained everything so well; I felt I knew exactly what we were doing and why we were doing it. Thanks for everything. I finally got around to making a will as well as powers of attorney and care. I sought out Anne as I had heard good things about her. I felt that Anne was really working WITH me as I grappled with difficult decisions. She challenged me to think carefully about what I wanted to achieve with these documents. In the end, I am very pleased with the process and the results. I highly recommend Anne as a lawyer for your will and powers of attorney and care.